With production beginning in the year 1996 and ending in the year 2006, Jaguar XK is no longer manufactured but it is still amongst the most popular Jaguar cars. This is due to its speed and performance. Jaguar introduced this car to the market in 1996. This was an era when lots of great cars were in competition. 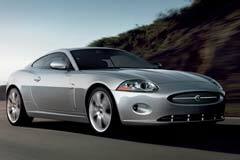 The British team at Jaguar introduced the XK which was recognized as the XK8 and it was codenamed the X100 project. The designers of the XK series did keep both performance and luxury in mind. Whatever the weather, the car is great when it comes to performance as well as adaptable driving styles. The car came in two sport bodies that were the coupe and the convertible which were fitted with the 4.0 liter Jaguar V8 engine. The V8 beneath the hood was a Jaguar AJ-V8 engine that was later utilized in other models. This engine was the 4th engine type to be built by Jaguar. 2007 XK -- 2007 Jaguar XK Liquid Silver AVAILABLE NOW!! 2011 XK -- Ultimate Black Jaguar XK with 45801 Miles available now!